If you have a new dog, especially a puppy or teenage dog, I bet everyone is telling you to get a Kong. Dog trainers are wild about Kongs, your veterinarian may even sell them in the waiting room, and every pet store stocks them in all sizes. The truth is, the Kong is just a hunk of hollow rubber, unless you start thinking like a dog. Dogs like games and puzzles that engage their amazing brains. They need to use their powerful sniffers, their paws, and their jaws to scavenge and extract food from tricky places. The Kong is designed to make all of this physical and mental challenge happen in a way that does not involve your furniture, rugs, shoes, undies or other potential objects of fascination. If your dog could talk, he or she would ask you to please stuff the Kong parfait-style: some smelly, gooey stuff in the tip (like cheese or peanut butter), layered with some kibble, then something globby like part of a banana, layered with a few dog biscuits or leftovers from last night’s supper (veggies are great, no cooked bones or toxic stuff, please), topped off with something easy to get started, like more peanut butter. That should keep your dog quiet in the crate, or occupied while you prepare dinner or watch Dancing With the Stars (in which case you obviously cannot lower your eyes from the TV, even for a moment). You also get Good Dog Owner points for providing an outlet for your dog’s daily behavioral needs. Yes, it’s gross, but your dog really will get every last morsel out (if not, adjust the difficulty by stuffing looser and using less goo). I put mine in the top rack of my dishwasher and, voila, they are sterilized and ready for another round. And I’ve had the same bloomin’ Kongs for 15 years. If your dog has mack daddy chewing power, get the black Kong. 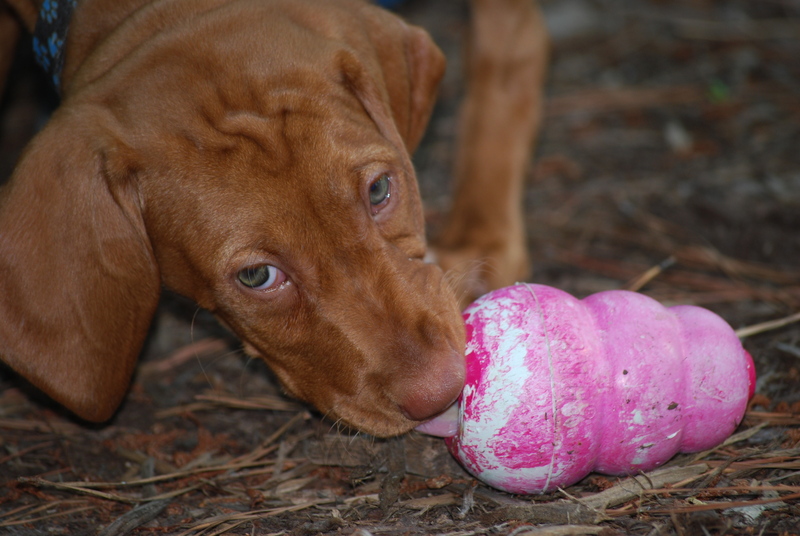 If your dog is a girl, or boy, and color-coding is important to you, get the pink or blue Kong. But please, get a Kong. Your dog will love you for it. While your dog is munching away, please share your recipes, success stories and questions and comments below. There is likely another dog owner out there who would learn from your experience. < Is Your Dog Ready to Hike Off-Leash? I don’t use mine very often because I get weirded out by how gross it gets as she plays with it (collecting clumps of dog hair from the carpet, etc.). Also I’m never sure if she enjoys the challenge or if I’m teasing her by making her work so hard to get the treats… I think I’m probably over thinking it! 😀 Kongs may not be ideal for neurotic/OCD types (humans, that is), although the dishwasher tip is good to know! Those things are hard to clean by hand! Ah, the slimy hairy Kong…the first time I saw this at home it was frankly a humbling and somewhat alarming realization (insofar as it implied I needed to vacuum more frequently). So, strictly hypothetically, I could vacuum more frequently, use the Kong only the day after I vacuum, or use the Kong only in the crate, yard, deck, or kitchen or hardwood floor. Other cleaning tips: use a bottle-washer type handled sponge or scrubber to get the nooks and crannies cleaned. The least gross way is the top rack of the dishwasher. For those who don’t have a dishwasher, just soak it in a bowl of water and then it all just magically rinses out. Usually. Mary, excellent point about the potential for teasing, and great that you’re looking at it from your dog’s perspective! You know, I actually do think it’s a bit frustrating for the dog to get out the challenging bits, but not frustrating in a bad way. A mild challenge that she solves through persistence, using her natural behaviors, is a wonderful quality of life enhancement. A dog’s mind is a terrible thing to waste. Kongs when leaving the house, kongs when keeping the roads warm, kongs when a good long solid distraction is needed, my horde has adapted to life with kongs for 8 years. Holding a kong full of peanut butter throughout a nail trim is the youngest’s, a hound mix, fave past time. Fearful fosters have lined up to approach a hand holding a kong, hole full of peanut butter and kibble facing them. I attempted to introduce a buster cube into the house the same week I started kong use many years ago, and those darn plastic boxes are so loud, and absolutely not clean-able! Loved the “orange moon” ball back then, too! Now we have Katie’s Bumper fire hose bottle holder, and we stuff treats, such as Pupcorn and kibble,within the bottle, which is within the bumper toy. Little dudes drag the bumper around, proving they can bottle crunch with the best of the big boys. I do not use them when not present, though, because strong chewers can shred the velcroed end eventually, and we don’t want that obstructing the gut. Great tip on how to use the Kong with fearful foster dogs (dang, you guys are creative). Can also use that to get a dog to walk from point A to point B through high distraction areas. Like from the car to the training area or through the veterinary waiting room. I agree the Buster Cube is loud (carpet helps, but holy cow the banging!) and I’m not sure whatever happened to the orange moon (was that the Roll-a-Treat?). Good luck with the upcoming move. May the Kongs and popcorn be plentiful! Kongs are great I show them off every puppy and beginner class. I have used so many things over the years. I had one dog with severe allergies, so she got her kibble and canned food inside for all three meals and then 2 meals when she got older. I used tsp canned in first, then kibble, then tsp to seal it up, made it easy to get first few meals, then started to freeze it. Then over the course of time, I got a tsp in first, then kibble then a tbs mixed with 1/4 kibble, then few days later, 1/2 kibble mixed with Tbs canned, until eventually she got it all kibble w/mix of Tbs can. She went from pink kong (puppy easy teething formula) to Red, adult dog, to Black (extreme chewer), they now have the purple senior kong, but she never made it to senior, she passed away from cancer at a young age. I also used a coffee cup to hold the kong and put kibble in and added water to soak it so it expanded inside, eventually also freezing it with kibble inside (I get some Pet Parents wanting no junk, so give them this option); you can put solid treat pces into it to vary it. I’ve used green beans, bananas, plain yogurt, pumpkin, carrot bits and even took low fat low sodium ckn broth mixed with water to make a kong “pupsicle” first Peanut butter or can food to seal hole at top, coffee cup set up in freezer. I use the moon orange ball to put the older dogs dinner to roll on floor, just kibble, PetSmart still carries them, if they are the ones you are talking about, (orange or blue ball, with large pock marks in it, looks like a large version of a golf ball). Such great ideas, thank you, Jamie! I especially like how you made it easy at first and then gradually more challenging/interesting as the dog got the hang of it with practice.